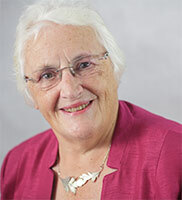 Patricia was elected to the NFWI Board of Trustees in 2009 and is currently NFWI Vice-Chair and Chair of the Denman Committee. She also sits on the Finance Committee and is a member of the WIE Board. Patricia was a Home Economics and Needlework teacher before becoming head of department in schools in Winchester and Northampton. From 1984-1998 she ran her own catering business. Patricia has been a member of several WIs, serving as Secretary and Treasurer at different times, and is currently Treasurer of Howick WI in Northumberland Federation. She was a member of the Northumberland Federation Board for nine years, including four years as Treasurer and Denman College representative. Patricia is interested in all crafts and cookery and qualified as a cookery judge in 2005. In her spare time she enjoys gardening, beadwork, dressmaking and reading.